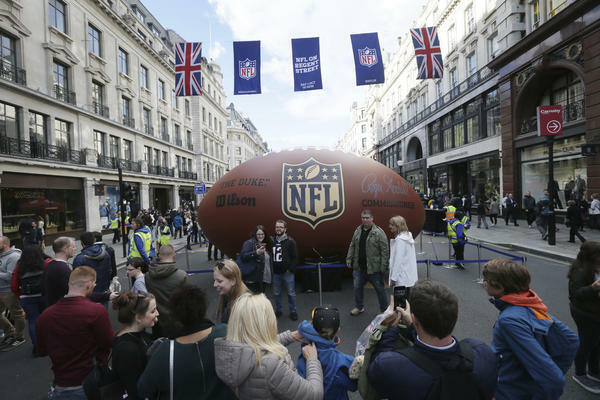 People pose for pictures during an NFL fan rally on Regent Street in London on Saturday. 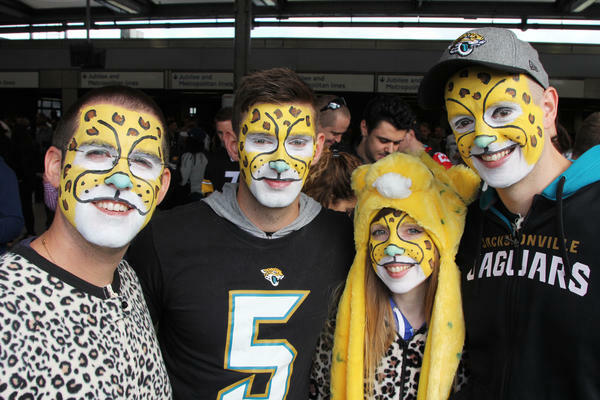 Fans from the English city of Reading don Jacksonville Jaguars onesies to cheer on the team, which has committed to playing games in London through at least 2020. 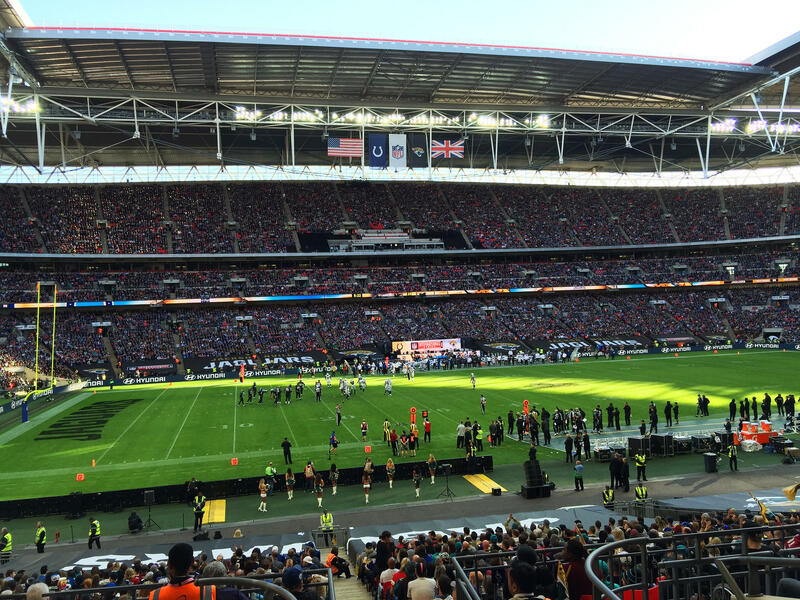 Thousands of fans wearing jerseys representing all 32 NFL teams attend opening day of the NFL's International Series at London's Wembley Stadium on Sunday. Adrian Schlauri, 24, and his father, Guido, flew into London from Zurich for Sunday's game. Adrian became a football fan while following his dad, who played in an amateur league. Adrian is wearing the vintage jersey of Hall of Fame Philadelphia Eagles defensive end Reggie White. The Jacksonville Jaguars' middle linebacker, Paul Posluszny, enters Wembley Stadium as a crowd of nearly 84,000 cheers. 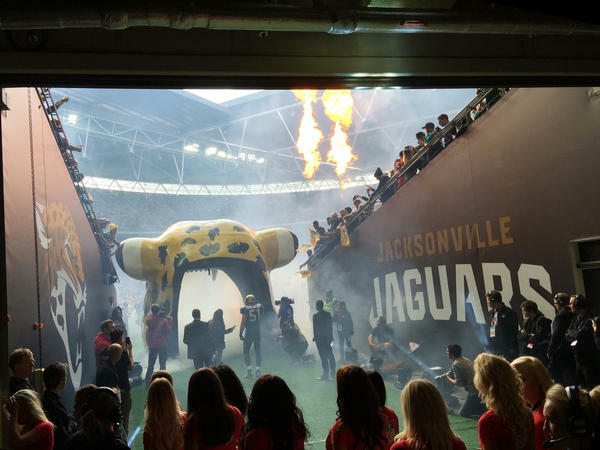 The Jaguars are the closest thing to a hometown American football team in London. Daniel Brewer arrived in London on Sunday morning wearing a Jacksonville Jaguars onesie and face paint, complete with black whiskers, brown spots and a blue nose. 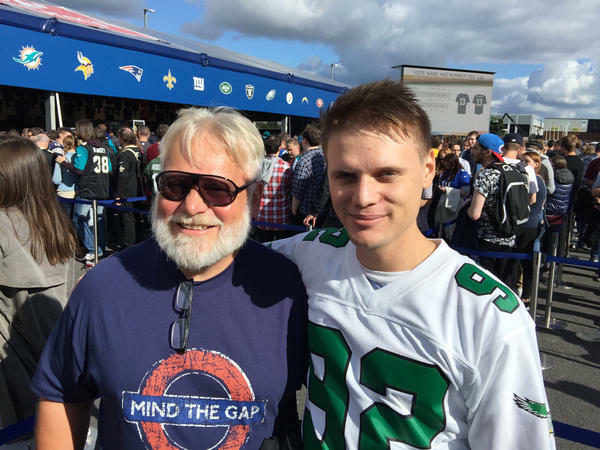 He had come with fellow fans from the English city of Reading to cheer on the Jags as they took on the Indianapolis Colts beneath sunny skies at Wembley Stadium. "None of us naturally are Jags fans," Brewer confided. "We all have our own roots, but because they signed a contract, they've got our hearts." The Jags have signed to play one game in London each season through 2020, making them the closest thing to a hometown team here. They're the only U.S. team to make a multiyear commitment, according to the NFL. Like most of the nearly 84,000 spectators who turned out for Sunday's game, which Jacksonville won 30-27, Brewer's favorite NFL team wasn't on the field. Brewer first got interested in American football through a woman he met at college from Baltimore. "So I'm a Ravens fan," he said. 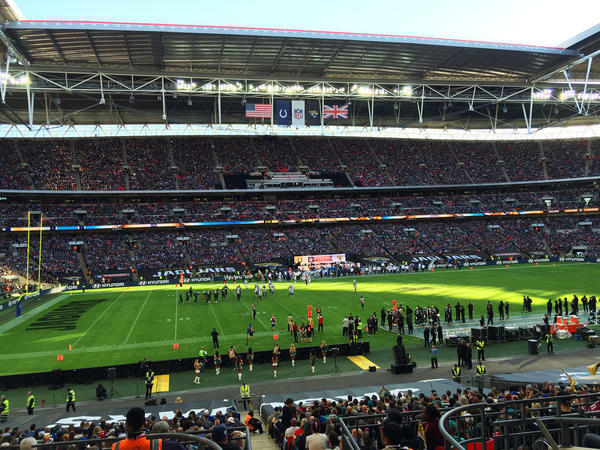 As the National Football League enters its 10th season staging games in London, the events have proven wildly popular, routinely selling out and drawing fans from across Europe. Brewer and many other fans here say they want more games — or even their own team. Unlike football fans in a U.S. NFL city, though, those here divide their loyalties among the league's 32 teams. Ride the tube — London's subway — on game day and you'll spot a jersey from every NFL team in a matter of minutes. For instance, Brian Moody-Smith, a 50-year-old carpenter from Kent, was wearing No. 44 from the Washington Redskins, a number made famous by John Riggins. Moody-Smith watched Riggins, a freight train of a running back, on British TV in the early 1980s, when he led his team to victory in Super Bowl XVII with a 43-yard touchdown run. More than three decades later, Moody-Smith is still awestruck. "He was the man," he said. Adrian Schlauri flew in from Zurich for Sunday's game. As he stood in line with about 1,000 other people to buy merchandise, Schlauri explained why he was wearing a vintage Philadelphia Eagles jersey with No. 92, which is associated with Hall of Fame defensive end Reggie White. "I'm an Eagles fan for about 12 years," said Schlauri — half his life. "Reggie White is one of the best players we had." Schlauri got interested in the game because his father, Guido, also here with him on Sunday, played offensive tackle for an amateur American football team in Switzerland. Many European fans say they are drawn to U.S. football because of the game's complex strategy, its exciting, big plays and the NFL's pageantry. Joe Luxford, wearing a Minnesota Vikings jersey, said he enjoys the outsize personalities and showmanship of the American players, such as retired Cincinnati Bengals wide receiver Chad Johnson, known for his elaborate end zone celebrations. "It's sort of like a theater-type performance," said Luxford, an IT recruiting consultant attending Sunday's game with childhood friends. "I know some English who don't like that in Americans in general. But us lot, we like that." Given the NFL's passionate following here, people like Jordan Mead, a restaurant manager, believe basing a team in London is a no-brainer. "I think within the next five years, there's got to be a franchise," said Mead, wearing a Jags jersey with his name on the back. But Nick Deaker, who drives a forklift and backs the Carolina Panthers, thinks fans here are too divided to make a local franchise work. "I can't see everybody changing their allegiance," he said. "They might come down for the first couple of seasons just to test the water, but after that, I can't see it lasting very long." The NFL will play three games in London this season and add a fourth to the series in 2018. Alistair Kirkwood, managing director of NFL International in London, says the league needs to look abroad for future growth. But there are big logistical questions. For instance, would distance from the U.S. pose a competitive disadvantage for a team based in London, because of the travel time? Kirkwood says the league has a lot of work ahead before it would consider expanding to London. He says the NFL needs to double its fan base here and make sure that a new team would strengthen the league as a whole — and that it would be sustainable for a generation or two of fans. "If you were to do it," said Kirkwood, "you'd want to do it with a guarantee of absolute success." Soccer is unlikely to be dethroned as the favorite sport of Europe, but American football is having a moment. CORNISH: A sellout crowd of nearly 84,000 people watched the Jacksonville Jaguars beat the Indianapolis Colts yesterday in London. It's part of an NFL International Series that's been running for about a decade. It's been so popular, fans in London say they want more games and maybe even their own team. NPR's Frank Langfitt reports. FRANK LANGFITT, BYLINE: Thousands of fans are pouring into Wembley Stadium right now. And I'm looking out over a sea of so many colorful jerseys representing all the different NFL teams. You've got New England Patriots, of course the Jacksonville Jaguars, as well as Green Bay. Daniel Brewer's arrived from the English city of Reading with a few friends wearing Jaguar onesies and whiskers. DANIEL BREWER: We're all dressed up like Jaguars. We were up early as this morning, putting on our Jags face paint and getting ready for the game today. We're hoping for a peat (ph) of last year. We want a Jag's W on the board. LANGFITT: The Jags has signed a contract to play one game in London each season through 2020, making them the closest thing to a hometown team. BREWER: I mean, none of us naturally are Jags fans. We all have our own roots, but because they signed the contract they got our hearts, so, you know. LANGFITT: So when you say they're not your roots, what are your NFL roots? BREWER: I go into it probably about 10 years ago through a girl who I met who was from Baltimore, so I'm a Ravens fan. LANGFITT: This is one of the aspects of fandom here that makes the NFL in London so different than it is in America. Most people who attend the games actually support one of the 30 other NFL teams that aren't on the field. MARVIN GAYE: (Singing) Keep on dancing. LANGFITT: Before kickoff, thousands line up at a league-organized tailgate to buy jerseys and caps. ADRIAN SCHLAURI: Well, my name is Adrian and I am from Switzerland. LANGFITT: Adrian Schlauri is standing in line with his family, who flew in from Zurich for the game. Schlauri has spent half his life rooting for the Philadelphia Eagles. He's even wearing a vintage Eagles jersey - number 92 - for Hall of Fame defensive end Reggie White. SCHLAURI: I'm an Eagles fan of - for about 12 years, and I watch on YouTube, so Eagles games and the history of the Eagles. And Reggie White is one of the best players we had. LANGFITT: Many European fans say they're drawn to American football because of the game's complex strategy, exciting big plays and the NFL's pageantry. Given the passionate following, people like Jordan Mead, a restaurant manager and Jags fan, think basing a team in London is a no-brainer. JORDAN MEAD: I think it's got to be in the next five years. I think how popular it is now, I mean, everyone I'm seeing here today, it's 80,000 people. I think within the next five years, there's got to be a franchise. LANGFITT: But Nick Deaker says fans are too divided to make a local franchise work. Deaker drives a forklift and backs the Carolina Panthers. NICK DEAKER: I mean, I can't see everybody changing their allegiance because the allegiances are set. Like I say, they might come down for the first couple of seasons just to test the waters, see what's going on. But after, I can't see it lasting very long. ALISTAIR KIRKWOOD: If you were to do it, you'd want to do it with a guarantee of absolute success. LANGFITT: Alistair Kirkwood is managing director of NFL London. Given the league's popularity at home, he says it needs to look abroad for future growth. But there are big logistical questions. Would distance from the U.S. be a competitive disadvantage for a team here? And, Kirkwood says, the league still has more work to do. KIRKWOOD: We need to continue to build the fan base. I think we need to kind of double it from where it is now. LANGFITT: Could you fill a stadium eight times a year here? LANGFITT: And not just a novelty. The NFL will play three games in London this season, and add a fourth in 2018. Frank Langfitt, NPR News, Wembley. Transcript provided by NPR, Copyright NPR.